The Island Heights Sailing Foundation wants to give selected young sailors on the BBYRA an opportunity to experience E-Scow racing at its best. 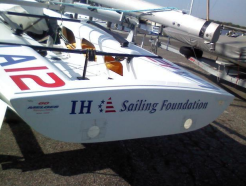 The Foundation will provide a competitive boats. The grant applications will be reviewed and the grant will be awarded with preference to age, level of interest, skill level and strength of references. Applications must be received by April 15, 2015 for the 2015 sailing season. Each applicant is expected to qualify in the morning and afternoon on the BBYRA and to sail in a predetermined number of regattas. The boat and equipment is expected to be maintained at the highest level. The grant is for the use of the boat and equipment for one year. Each recipient will be assigned a “mentor” for the season. Each Applicant must have medical coverage. To apply for this grant, Read the Grant Requirements and Selection criteria, print out the application and mail or email to the IHSF Office. This program is geared towards younger sailors (under 30) with a desire to race E-Scows. You could be a sailor on a high school or college sailing team looking to augment your dinghy sailing skills in a larger boat or to test your ability against larger fleets. You should have current E-Scow experience. Postmark is not controlling, the application must be in the Office by midnight April 15, 2015.
b) You may submit your application via email to: wdemand@ocua.com and include "Boat Grant Application" in the subject line. from two sailing references. They can be a current or former coach, a competitor, a member of your yacht club, or any other sailing reference who knows you well. d) A personal letter outlining what the grant would mean to you and why you are the best candidate for a grant. 3) If you are under 18, your application must be accompanied by a signed letter from a parent or guardian in support of this application, with the understanding that they will be responsible for the boat and your activities. Each Applicant should submit whatever information they deem necessary to the Selection Committee above and beyond the application if they feel it necessary. The importance (weight) of each of the main 7 categories of information is indicated below. In addition, there is an additional 10 bonus points for the quality and innovativeness of your application. Please note the submission procedure outlined in "To apply for the grant." GOOD LUCK AND THANK YOU FOR PARTICIPATING! If you have any questions please submit them and we will post the question and answers for all applicants to read.